The American Heritage® Student Science Dictionary, Second Edition, for students in grades 7 and up (ages 12 and up), provides comprehensive coverage of all the sciences. The dictionary includes more than 4,500 entry words in A–Z format, 450 full-color photographs and drawings, and over 150 in-depth notes. Definitions are written in easy-to-understand language. Additional features include full-page treatment of complex topics such as photosynthesis, and several tables and charts, including the periodic table and a chart of geologic time. More than 250 new entries and senses have been added to this brand-new edition, including cloud computing, genetically modified organism, and the recently named elements flerovium and livermorium. The Editors of the American Heritage Dictionaries are a team of professional lexicographers with advanced degrees in various scholarly fields. The editors familiarize themselves with the vocabulary in specific subject areas, collect materials on new developments and usage, and work with expert consultants to ensure that our publications are accurate and up-to-date. 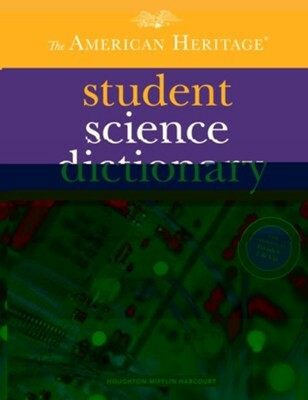 I'm the author/artist and I want to review The American Heritage Student Science Dictionary, Second Edition.